used fictitiously. Any resemblance to actual events, locales, organizations, or persons, living or dead, is entirely coincidental and beyond the intent of the author or the publisher. No part of this book may be reproduced or transmitted in any form or by any means, electronic or mechanical, including photocopying, recording, or by any information storage and retrieval system, without permission in writing from the author. And titles, please visit her website. Even with the thick planking and insulation between the rooms, Tory Kalich could hear the baby crying. Or maybe it was just her own natural mothering instinct that caused her ears to pick up on the muffled, tiny wailing that was almost too soft to be heard at this distance. She listened as hard as she could. It wasn’t long before the crying stopped. Atty had gone to care for her son. Silence returned to the bedroom like an unobtrusive guest. Tory continued to lie by her husband’s solid warmth, and listened to the night sounds. Through the partially open window on the other side of the room, she could hear an owl screech as it hunted. Crickets chirped in rhythm. Every now and then, a firefly blinked for his mate, and she replied. Otherwise it was totally still. Quiet in that soothing, comfortable way. Fortune snorted softly and rolled onto his back. Tory reached over and gently put her hand on his shoulder. She didn’t want to think back on the agony of the past few months when she had thought he was dead, killed by the Bloods at Bearinger. The memory was still too recent and too damn painful. Which was why she guessed she was awake. Shreds of those nightmarish days and nights sometimes crept back into her subconscious, and she would wake up shivering, panting from the crushing weight on her chest, her nose running and her eyes puffy from crying. Tonight she’d had another one of those moments. She couldn’t remember exactly what she had been dreaming, but she knew it had to be one of the bad ones. And when she’d jerked up into a sitting position in bed, that was when she’d heard little Mattox’s wail of hunger. “Fortune?” She gave his arm a nudge. “It’s time we went home,” she announced. She gathered her hair in her hands and pulled it to one side before lying back down. Fortune scooted closer and drew an arm around her waist. “Homesick?” he whispered. “Corianne is a handful. He’ll be a busy boy.” Fortune chuckled. He suddenly lifted his face toward the ceiling. “What? Hear something?” Tory asked. The Mutah woman watched her husband slowly sink back into sleep. Placing her hand on his strong back, she let herself drift away as well. Yulen stopped at the threshold of his lodge and glanced over the interior of the compound. Hooded blue-gray eyes scanned the sea of faces coming and going before him as he searched for the flash of dark blue that would let him know where Atty was. Initially, he had thought she would still be in bed. The baby had been cranky most of the night, giving them little rest as they took turns rocking the infant when Atty wasn’t feeding him. This morning when he had climbed out of bed, she had been sound asleep, unaware of his rising. Now she was gone from the lodge. Mattox as well. Even Tory and Fortune were not there, which could mean anything. Atty could be on a hunt, leaving their son with Tory. Or his wife could have Mattox, and the Mutah couple from Wallis could be out and about on their own. Sighing loudly, Yulen wondered where to begin. His best bet would probably be the main lodge. Atty’s appetite knew no limits. And now that she was breast-feeding, she was a frequent visitor to the kitchen for in-between-meals snacks. If she’d gotten up too late for breakfast, that would be the first place she’d go. He stepped away from the lodge and began heading for the large building in the center of the compound. He was barely a dozen yards away from the side door when Berta came around the corner with her small entourage of people to do their daily cleaning of the Battle Lord’s home. Seeing him coming her way, she stopped and flashed a smile. “Is Atty in the kitchen?” he asked curtly, not caring to mask the slightly irritated expression on his face. She’s at the archery field. Yulen thanked the woman and turned on his heel to head for the practice fields at the rear of the compound. Within ten minutes he’d spotted her. She was sitting under a tree some distance away from where his soldiers were taking in their own practice. She seemed to be bent over something as she lifted an object to her mouth every few seconds. Beside her, Mattox lay asleep on his back on a small, folded blanket, one corner draped over him for protection. 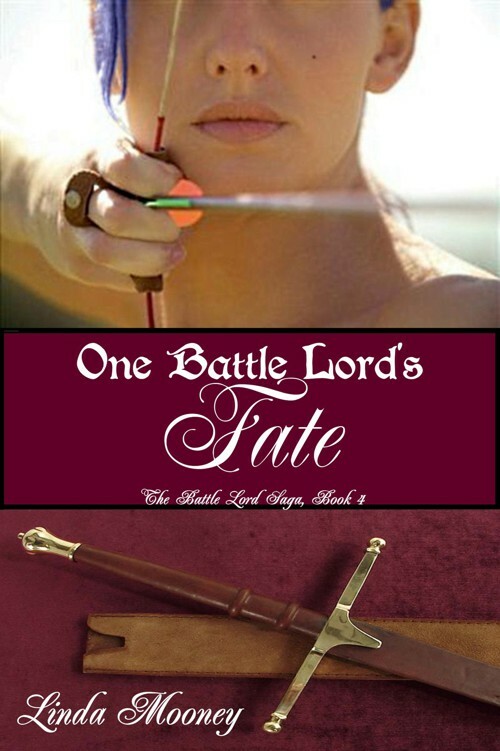 The Battle Lord paused, watching her and taking advantage of the rare opportunity he had to study his wife unobserved. Atty was such an ephemeral creature. She was like the air, never staying too long in one place. She was a wood sprite, melting into the forest and becoming one with all around her when she hunted. She was fire, quick tempered when angry, but also like fire, burning with unquenchable passion when aroused. Just the sight of her was enough to get the blood rushing to his head. Yulen gripped the pommel of his sword. God, he loved the woman with every fiber of his being. As he drew closer, he finally was able to notice she was reading a book, and the realization surprised him. Atty reading a book? With her head down, she had no sense of him approaching until she turned a page and caught his approach from the corner of her eye. The smile she gave him was warmer than the spring sun. “Good morning!” she chirped as she watched her husband lower himself down to the grass to sit in front of her. She moved aside a small napkin containing a nearly empty stem of grapes. “Like what?” Curious, Yulen took the book from her and ruffled through a few pages. His eye caught the words “bull ferret” a couple of times. A butterfly landed on Mattox’s tummy and gently flapped its yellow and black wings. Yulen backhanded it away with the book. “The story ends with me coming back to Alta Novis and killing Karv,” she told him. “Knew you were the type to read the last chapter before you’d gone through the entire book,” he teased, glancing up at her. Atty stuck her tongue out at him. “Anyway, what I was going to tell you was that rumor says there’s going to be a second book coming out, telling about the Massacre at Bearinger.” Her expression became sober, and she dropped her gaze. They had only been back less than a month, yet memories of that experience evoked a pain still too fresh to recall. Both of them had suffered physically, mentally, and emotionally. It would take many more months before they could think back on what they had been forced to endure without remnants of the fear and terror washing over them. “I did,” he nodded. “Work is going better than I’d anticipated. No need hanging around there if it’s up to my specs. So I thought about wandering over to the practice field and getting in a few jousts before tackling the paperwork.” He sighed loudly and reached behind his head to knead the back of his neck. “Are you sure, my love?” she asked worriedly. It would take a few more weeks, perhaps months, before all the wounds he’d suffered under the Blood Leader’s hands were sufficiently healed. Chuckling, Yulen closed the short distance between them and gently pressed his lips to hers. It was a chaste kiss, and the only kind they had been able to share these past four months. The Massacre at Bearinger had been devastating to everyone living within a week’s journey from the compound. A small garrison of soldiers, most of them from Alta Novis, and led by Yulen, had tried to defend the compound from an ever-enlarging army of Bloods. Eventually the mutant army, numbering well over a thousand, had eventually overrun the fortress, overwhelming soldiers and citizens by sheer numbers and viciousness. The resulting wholesale slaughter was beyond description. Somehow, Atty had known when the Bloods had taken the compound. The mind-numbing horror she’d felt was still there, buried under layers of relative calm. Once in a while, her screams would find their way to the surface, and she’d awaken trembling and crying, until she was able to find surcease in her husband’s arms. Yulen had fared worse. One of the less than a hundred survivors, he and the others had been dragged back into the woods by the Bloods, who used them as a food source for the winter. Knowing Yulen was the Battle Lord and the man responsible for all their troubles, the creatures had taken special delight in torturing him every night after they’d made camp. They had intended on breaking the man and utterly destroying his mind, body, spirit, and soul. Problem was, the Bloods had never counted on Atty. Through some miraculous connection with her husband, she had managed to lead a rescue force to where the unsuspecting creatures were camped for the night. The battle to retrieve the survivors had been fierce, but the outcome was not unexpected. In the end, every Blood who had participated in the massacre at Bearinger was dead, but not before Atty had enacted her own method of revenge on the creature who had tortured Yulen. She had killed the Blood Leader with three calmly-placed arrows that took out half his brain, and made sure the creature writhed in agony until he’d bled out every drop of blood. But the agony was not over. It was winter, and the weather was fast becoming another enemy to the struggling, suffering remnants of the battalion. Yulen was dying. Atty had no choice but to take him to a Mutah compound and pray they could save him. They had, but Yulen remained comatose for another two months. Eventually he regained consciousness and his strength, while Atty’s condition worsened as her pregnancy advanced. Six weeks shy of her due date, she went into premature labor and ruptured a blood vessel before delivery. It was a miracle she survived, as well as the tiny but healthy little boy she gave birth to. Afterwards, it was only a matter of waiting for them both to gain enough strength so they could return to Alta Novis, which had taken another month.